Astrid Jones copes with her small town's gossip and narrow-mindedness by staring at the sky and imagining that she's sending love to the passengers in the airplanes flying high over her backyard. Maybe they'll know what to do with it. Maybe it'll make them happy. Maybe they'll need it. Her mother doesn't want it, her father's always stoned, her perfect sister's too busy trying to fit in, and the people in her small town would never allow her to love the person she really wants to: another girl named Dee. There's no one Astrid feels she can talk to about this deep secret or the profound questions that she's trying to answer. But little does she know just how much sending her love--and asking the right questions--will affect the passengers' lives, and her own, for the better. 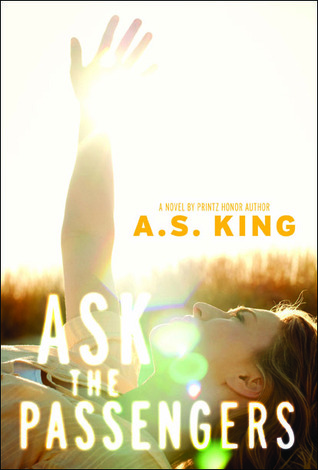 I loved A.S. King's Please Ignore Vera Dietz. In fact, I am ashamed that I haven't read her other books yet since I loved Vera Dietz so much. It doesn't help that now I have this book to add to the pile which sounds equally as compelling as all of King's other plot descriptions. i love that cover! i heard about vera dietz, but never read it. sounds good! Found you on WoW and just LOVE the blog theme and idea. Travel, food and books! What more could a girl want, really?